Closest building to the main lift. This unit is a large (800sq ft) one bedroom two bath with two queen size beds and the living room has a queen sleeper. With two bathrooms it comfortably accommodates six people. The condo has plenty of space and seating. There are two tables, each with seating for four. LCD TVs and DVD players in the living room and bedroom. WiFi. Closest building to the main lift, American Eagle. From the West door of the building it is 25 steps to the lift. We are continually updating the condo every year. Read our reviews, we receive complements from almost everyone who stays. We live in the Denver area and enjoy skiing. We purchased at Copper because it was and still is our favorite place to ski. We do everything we can to make sure everyone who stays at our condo has the best time possible. We use the condo a lot and are continually updating it. The best ski mountain in Summit County. Located in the center village, can easily walk to restuarants, shops and activities. Copper Junction is the closest building to the main lift. Can ski down to the patio and store skies in the locker room accessible from the patio. Best location at Copper Mountain. Located in the center village next to the area where most of the events take place. The condo is very spacious and comfortable. Bedroom has LCD TV with built in DVD player. I think Copper is the best ski mountain in Summit County. 2 bathrooms. Shower and bathtub in main and shower in 2nd. Hairdryers in both. The building has laundry facilities. Athletic club located one block away. Large living room with queen sleeper and table. Two tables each seating 4. One in the kitchen and one by the windows overlooking the slopes in the living room. Two LCD TVs. One in the living room and one in the bedroom. Both connected to DVD players. A selection of games are in the condo. We loved being so close to the lifts (eating lunches at the condo instead of the restaurants saved us a ton!) and the condo was comfortable and bigger than expected. Slight negative: if you're a light sleeper like me, you may be bothered by the banging of the radiator pipes above you (it's an older building and walls are thin), but the sleeper sofa was a comfy escape. Overall, great location and great value. We were satisfied! This is our second spring break in this condo, and we’ll be back again next year. The owner continues to make upgrades and improvements to this condo, and it’s perfect for our family of 3. The kitchen and bathrooms are well stocked and clean. The owner is responsive and easy to work with. My favorite thing about this building is it’s proximity to American Eagle lift, and the ski locker—the lift is within 25 steps of the condo building. We can easily access the condo for lunch breaks and the restaurant in the base of the building. Location is perfect for dedicated skiers! Great place to stay. Thank you. 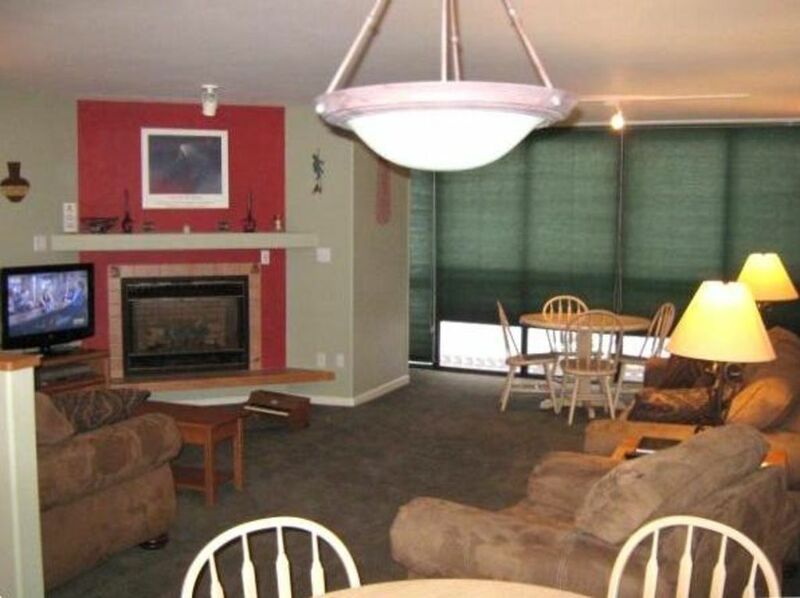 Mike and Linda Nolte R.
This unit has a beautiful view of the slopes, prime location just a few steps to American Eagle and Copper Village, and spacious and well-maintained accommodations, Everything is convenient! Four adults comfortably slept six nights here including Mom and Dad on the pull out sofa with no complaints! And, Mert was very responsive when we somehow lost our entry keys several states away! This is the best place by far that we have stayed in our past four visits to Copper! Stayed for a week in the summer. This was so much nicer than crowding 3 people into a hotel room. We were able to cook some meals, so we saved some money that way. Kitchen was well equipped, beds were comfortable. It would have been nice to have a ceiling fan in the bedroom, because the window faces out to a walkway for the building (with lights), so it was too bright to leave the shade open to let in a breeze. We made it through with a box fan in the doorway, though! Would definitely consider staying here again. Clean, comfortable, excellent location, nice people... highly recommend it! Rates include cleaning and all other expences.